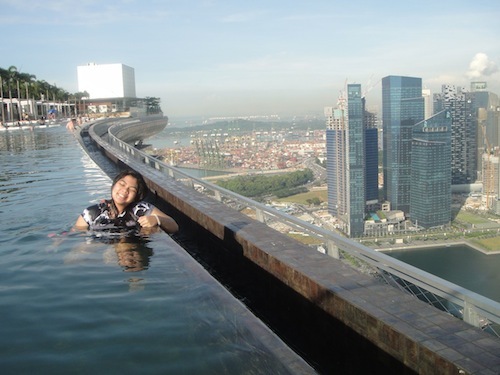 This photo was taken at my family’s favourite infinity pool, which is at the Marina Bay Sands, Singapore. It may sound a bit pretentious, but it is Singapore, currently the most expensive city/country in the world. And yes, it is damn expensive to stay in this hotel and I heard that it is equally expensive to come by the hotel just to use the pool – I don’t exactly know how much. But hey, if you want to swim on top of a whole country and feel like you are on top of the world, I guess they can charge you as much as they want. And I guess, if you are on top, you might as well enjoy it – just look at my sister’s face! Just a thought: this currently very popular song may be a great soundtrack to a morning swim at this infinity pool. Thanks to this week‘s photo challenge! OH WOW! That is one heck of an experience Alien!!! What a thrill. It looks (Literally) out of this world! Yes! 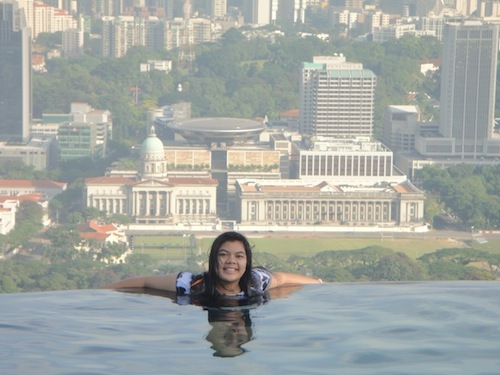 The infinity pool and the view from it is quite breath-taking, indeed. Thanks for your visit, Lita!